They came to Old Trafford to witness the greatest footballer of the game’s modern era declare his genius. They left having seen Lionel Messi’s performance overshadowed by that of a lanky 22-year-old from Lancaster. ‘McSauce’, ‘The McTominator’ or just ‘Scotland’ as he is affectionately known by some team-mates at Carrington. Whatever you call him, please, put some respect on his name. Scott McTominay has arrived as a Manchester United player. Yes, last night’s Champions League quarter-final at Old Trafford was largely low on quality, and not to mention a fourth defeat in five for Ole Gunnar Solskjaer’s United, but the rise of this unlikeliest of stars continues apace. A month-and-a-half ago, McTominay was handed his first start of any real significance under Solskjaer, against Liverpool. He dictated the play from the base of midfield that day and has not looked back since. In the defeat to Wolverhampton Wanderers last week, which saw McTominay score his first senior goal for the club with a low, rasping drive from the edge of the penalty box, his performance was the only real positive United could take. And between those two performances, of course, came that night in Paris, where he and his similarly-maligned midfield partner Fred turned United’s most obvious weakness into their strength, laying the foundations for one of their most famous European victories. If McTominay and Fred at the Parc des Princes was a low-budget, feel-good buddy flick turned unlikely box-office success, last night against Barcelona came the sequel: rushed out the gate, a little rougher around the edges but still an immensely enjoyable romp. Fred was the straight man: taking more touches, making more passes, recovering possession more often than any other player on the park. That left McTominay with all the best lines, earning the acclaim and attention. There was the moment towards the end of the first half when, under pressure from Sergio Busquets, Arthur and Philippe Coutinho, McTominay dallied, turned and evaded all three of his markers to find a red shirt in space. There was the feint and switch mid-way through the second half, inside his own penalty area, which coaxed Arturo Vidal into a hopeless sliding challenge and then charged him a readmission fee. And because this is the Scott McTominay of the last few weeks and months, there was also all the simple stuff, done without fuss but to effect. McTominay won more aerial battles than his team-mates and beat opponents the most often too. Trust is a key element in any successful playing career – trust in your manager; trust in your team-mates; a sense that you yourself are trusted. 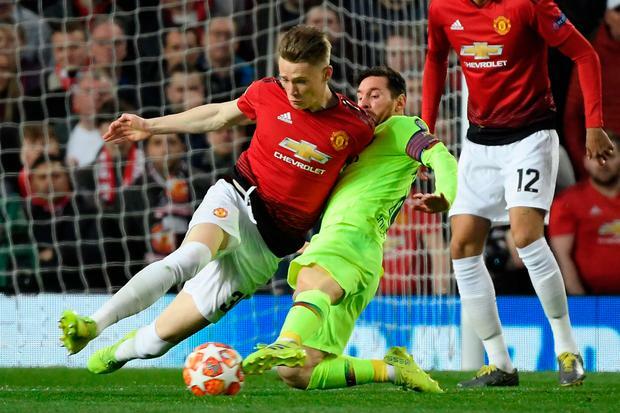 It is the latter, perhaps, that McTominay has been waiting for all along. This is a young player who, this time last year, was easily dismissed as a pawn in the internal politics of Jose Mourinho’s United. His 6ft 4in in height, rather than any notable technical ability, was cited as the reason for his promotion to the first team. And however inaccurate it may be, a ‘teacher’s pet’ image is hard to shake – particularly when the teacher devises an entirely new award on the night of your end-of-season dinner and presents it to you – the inaugural ‘Manager’s Player of the Year’. When Mourinho departed, McTominay was duly earmarked as one of those who could suffer from a change in the manager’s office. Instead, he was offered a new contract. Then he started against Liverpool. Ever since, he has repaid Solskjaer’s faith. And the McTomaissance could arguably not have come at a more timely point of United’s season, while questions start to be asked about the make-up of Solskjaer’s squad next year. As some United midfielders negotiate their summer departures or do little to quell rampant speculation regarding their futures, here is another beginning to show he has the ability and mentality to step into their shoes if necessary.